As winner Lionel Messi waves goodbye to the Ballon d'Or stage (presumably to have a glass of something fizzy to celebrate), it is time for us to say farewell too. But the excitement doesn't stop there - head over here to follow the FA Cup fourth round draw. See you next year! You can always count on support from your family apparently. Not Juventus midfielder Paul Pogba. His brother Florentin, the Guinea national captain, chose not to vote for his younger sibling, instead choosing Messi, Ronaldo and Manuel Neuer as his top three. Did Messi and Ronaldo vote for each other? Not for the first time, Messi and Ronaldo showed tactical voting at its worst. Argentina skipper Messi's top three comprised of Luis Suarez, Neymar and Andres Iniesta. Coincidentally they are all Barcelona players. One of the most exciting post-Ballon d'Or pastimes is trawling through the entire voting breakdown and analysing all of the picks. Messi and Ronaldo are the best two players on the planet without question, right? Not in each other's eyes. Kumbundoo Iddrisu: And Messi wins for the 5th time. Well deserved. I can see Neymar winning in the coming years. 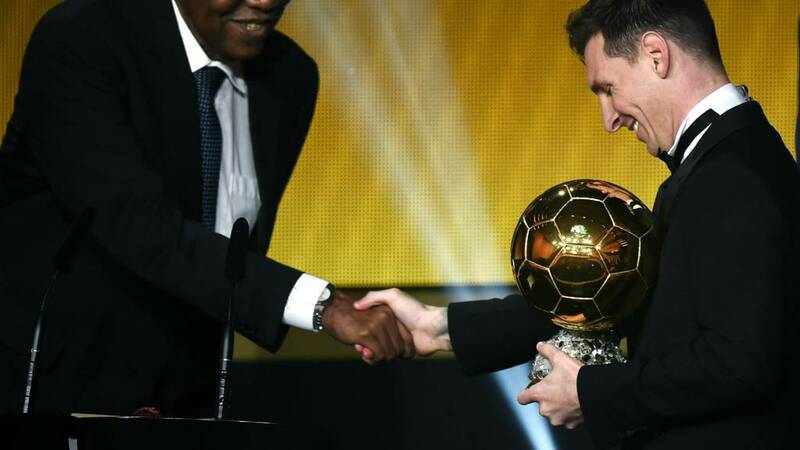 Edwin Makokha: Ballon d'Or for Messi, again? yawn! Kandela Wilberforce: Congrats Lionel Messi on winning your fifth prestige Ballon d'Or. #Messifalse is a genius!!! Messi's grin is wider than the River Thames as he manages to find the phrase 'thank you' in his limited English vocabulary when congratulated on stage by US women's coach Jill Ellis. Northern Irish host James Nesbitt uses the final credits on Fifa's live programme from Zurich to take a selfie with Lionel Messi, shortly after the Argentine is joined on stage by his female counterpart Carli Lloyd. Barcelona's five-time winner Messi on regaining the golden bauble: "It is a special moment to win another Ballon d'Or after watching Cristiano win. It is incredible it is my fifth, more than I dreamed of as a kid. "I would like to thank all who voted for me, my teammates and football in general for everything it has brought me, bad and good, it has made me grow and learn always." Sat in the front row, Messi's son grins and waves at his dad, who strokes he famous golden bauble as he thanks all the important people - his team-mates, his wife, his agent.... Even great rival Cristiano Ronaldo manages a smile. He doesn't mean it does he?! There was never any doubt was there?! Barcelona superstar Lionel Messi wins his fifth Ballon d'Or. He was so good they named him, er, once. Brazil legend Kaka, who won the 2007 Ballon d'Or, is introduced on stage to present the main prize. "When I arrived here yesterday the feeling about when I won the Ballon d'Or came back. I know Cristiano and Lionel, despite winning many times, will be feeling the same now." Who votes in the Ballon d'Or? The three-man shortlist of Messi, Neymar and Ronaldo was named from an initial long list of 23 players. Wales forward Gareth Bale was the sole Briton nominated, along with five men based in the English Premier League. But - like Bale - Manchester City trio Sergio Aguero, Kevin De Bruyne and Yaya Toure , plus Arsenal forward Alexis Sanchez and Chelsea midfielder Eden Hazard, were all trimmed at the first stage. Votes are cast by the coaches and captains of all international teams - plus a selection of journalists - to decide the Ballon d'Or winner. Now is the perfect time to remind you of Roy Hodgson's vote last year. Unheralded Argentina midfielder Javier Mascherano. Obviously. Carli Lloyd: "It is an honour. It has been a dream, ever since I started with the national team. I would not be here without my teammates. "Keep your dreams and just go after them."